The Central Bank has recorded an increase in deposits at the various banks operating in the country, the Head of Banking Supervision, Bank of Ghana (BoG), Osei Gyasi, has disclosed. He said the Central Bank noticed the trend after the implementation of the banking sector reforms by BoG. Mr. Gyasi mentioned that the new development indicates an improved customer confidence that banks that survived after the reforms are capable of holding their funds. According to him, the outlook of the banking sector is positive and the Central Bank is committed to fully implement all rules and regulations which will ensure a stronger financial system. He made the revelation at the Ghana Investment Promotion Centre (GIPC) 'CEOs Breakfast Meeting' themed: 'Ghana's Banking Sector Reforms'. The forum is part of initiatives by the GIPC to attract investors into the economy and also to help meet its target of $10 billion investment by the end of the year. Chief Executive of the GIPC, Yofi Grant, commended the effort by the Central Bank to strengthen the banking sector. 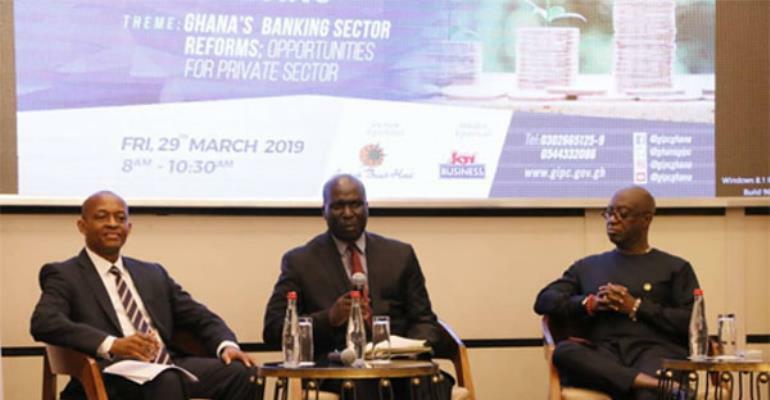 Former President of the Association of Ghana Industries (AGI), James Asare Adjei, on his part, appealed to the banks to lend to the private sector businesses, especially the indigenous organisations. “We have heard from the Bank of Ghana that deposit is growing on the back of the reforms but businesses continue to struggle for credit. Despite the numerous calls by industries that we need their support, lending is still on a low side,” he stated. The former AGI boss also renewed calls for the government to implement a fixed exchange rate system to help importers and exporters during their transactions. According to him, the current fluctuations in the currency present a major challenge for businesses in the country.